Sometimes it is hard to crystallise your thoughts about an event especially when there is so much visual white noise around. I found that after visiting Chelsea 2012. I have attended three Chelseas now, each separated by a period of 2 years and each time I try to distil the essence of the show in terms of trends. 2012 was difficult. Too much information I think. I watched the amazing BBC coverage, the interviews with the designers and the commentary. All were more concerned with the minutiae, the detail of which plants were used, how the original specimens had been delayed by cold weather and where the stone was sourced. While this is all very interesting, I prefer to look at the big picture, the trends, the direction gardens are taking and what the future will be like. This media and designer obsession with detail does not help us see the future but merely obfuscates any analysis of new directions. This year I found myself drawn more to the detail than the big picture. In difficult times, there is a natural tendency to become a bit nostalgic and from our comfortable Australian base, hardly touched by the GFC, we can easily forget that Europe is doing it tough. So designers set about celebrating the familiar with an “everything old is new again” approach. The designs were much of a muchness, a bit modern, a bit traditional, a bit god-knows what and some pretty to look at in situ but not transportable, albeit perfectly done. 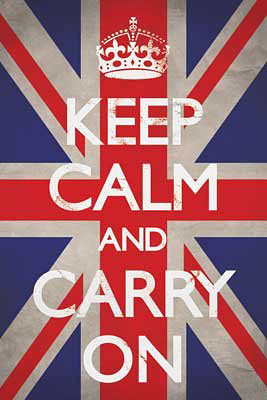 I’ve come to the conclusion that Chelsea is about maintaining a status quo just like the posters all over London say, “Keep calm and carry on”. When someone cheeky with humour and creativity comes along, like Diarmuid Gavin for instance, who turns the conventional wisdoms on their head with something truly creative, there is this slightly condescending tolerance an “Oh, well that’s Diarmuid” and on go to the next more conventionally traditional garden. 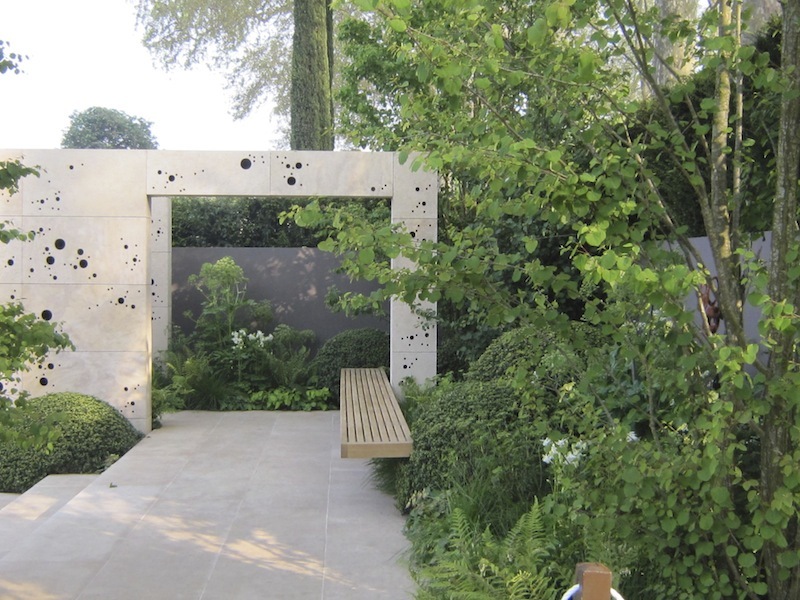 Design at Chelsea is a continuum, a re-evocation of what works for the UK, culturally and horticulturally – and that’s as should be. There are subtle evolutions though and movements in approach that are responses to needs. Drought and climate change are two common areas of concern in Europe and in Australia. If there is any “trend” it was the way plants were combined, the weaving of plants into a tapestry of hyper-naturalness, an abstract reinvention of the knot garden or the fresh approach to cottage themes. 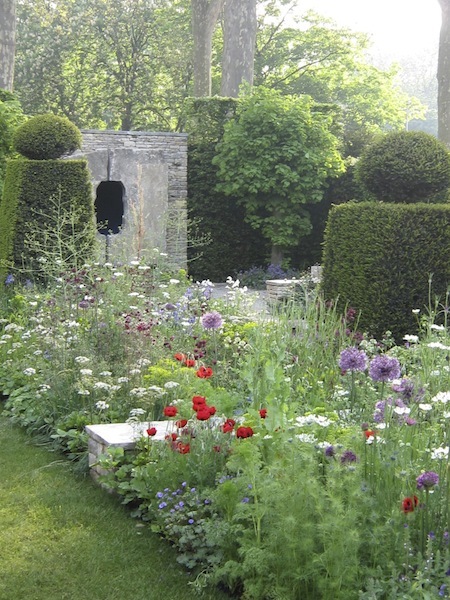 Andy Sturgeon looked at the Arts and Crafts gardens of the early 20 century, of British garden design epitomised by Sissinghurst and Hidcote Manor, reinterpreting their green-hedged garden rooms with carefully crafted stone walls. Cottage plants mingled with hard landscaping in what was termed ‘New English’ style – strong, formal features set within an informal planting. 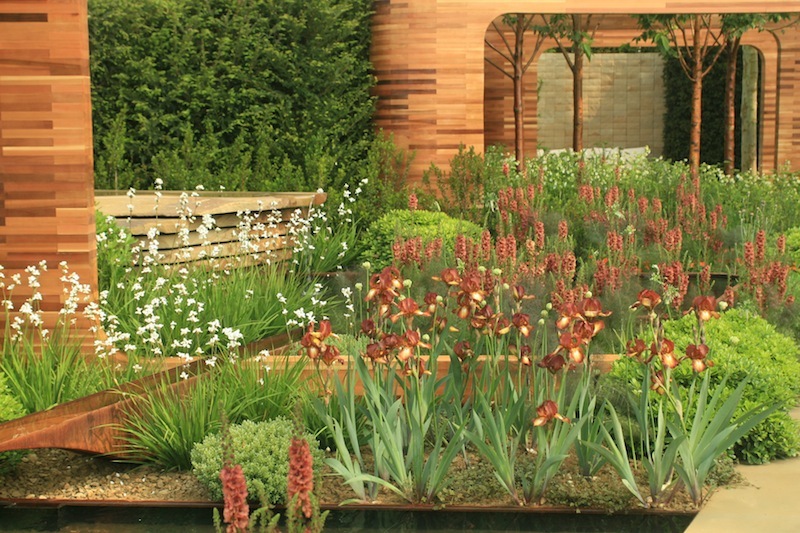 Plants used are Aquilegia ‘Chocolate Soldier’ and Iris chrysographes ‘Black Form’. For borders, he used tall Katsura trees Cercidiphyllum japonicum for height and passages of clipped holly and umbel-form flowers to direct views. 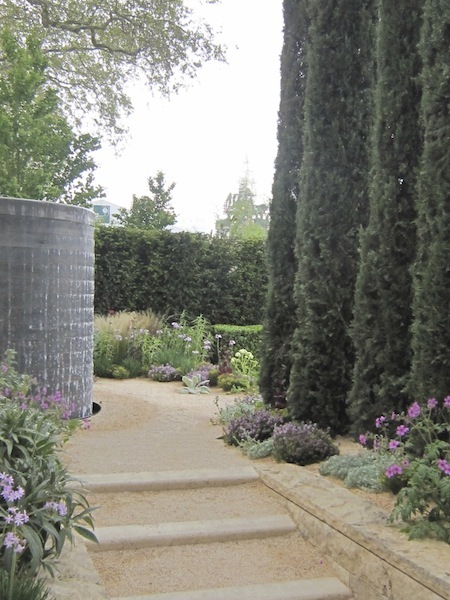 This was the sponsor’s take on Cleve West’s beautiful garden which looked back to formal European design using antique elements and big, slightly wibbly-wobbly topiary, not too perfect, to give it a more contemporary twist. 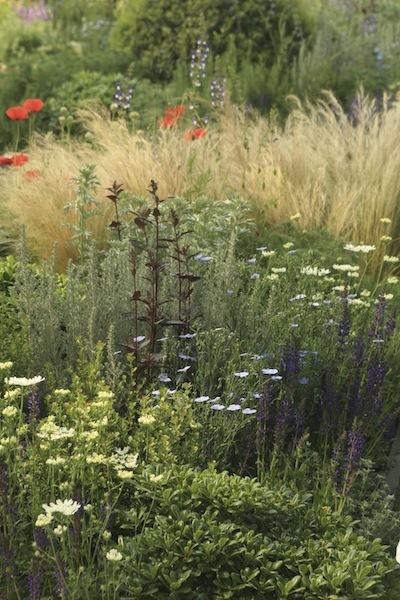 The major planting was very formal while the ground space was filled with tapestry-like mixtures, soft and delicate with the odd punch of colour. 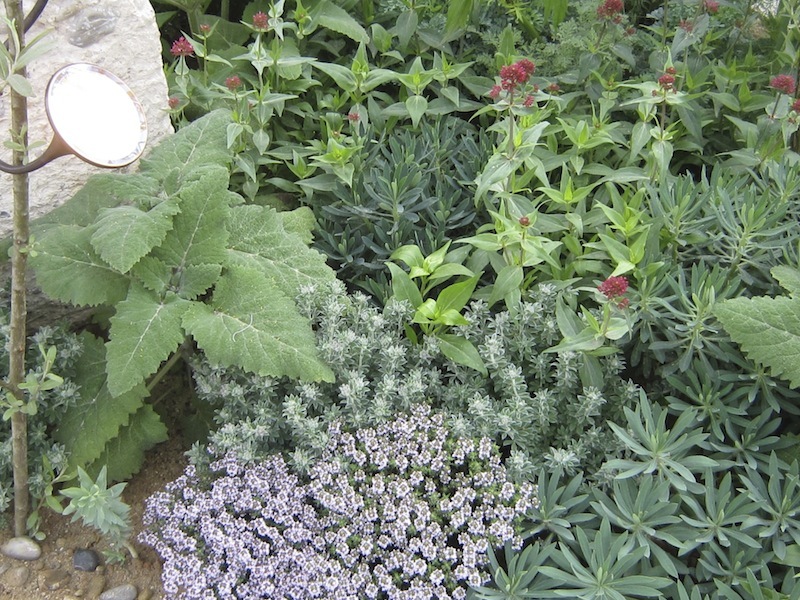 Old fashioned nigella, columbines, ferns, foxgloves, geranium and geum were supple and delicately interplanted. It begs the question, is cottage coming back? Not a veggie to be seen. 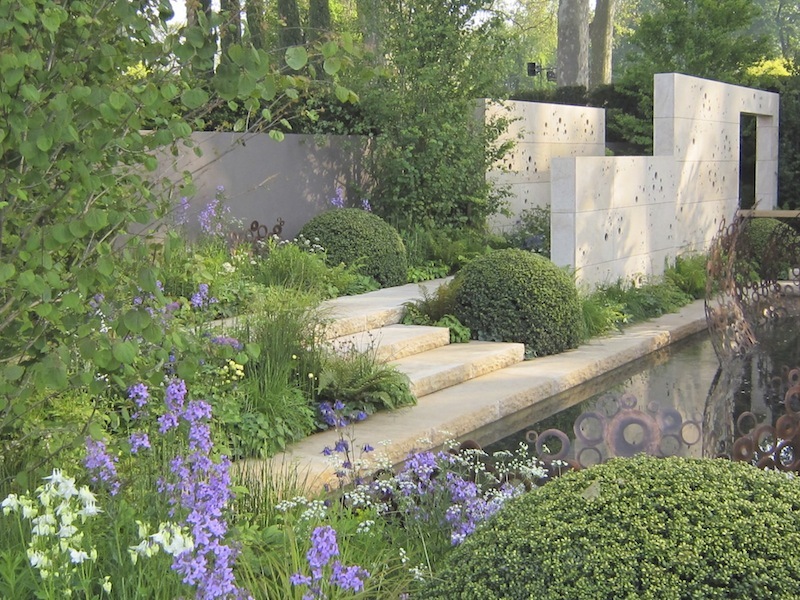 Joe Swift is a popular BBC personality and his first Chelsea garden used plants that survive on little water. His design employed a broad central axis path and strong verticals in the laminated cedar arches. 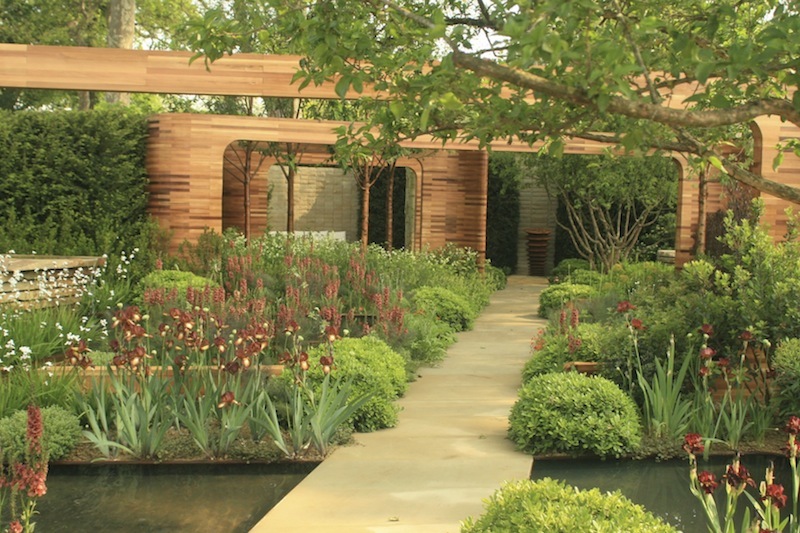 The planting of tan-flowered Verbascum ‘Clementine’, bronze iris and Dodonaea and coloured trunks in Cornus mas and Prunus maackii ‘Amber Beauty’ was masterful and pointed up why we look to English gardens for inspiring combinations. The verbascum and iris were woven through euphorbia, bronze fennel and Pittosporum tobira nana with its contrasting lime green new foliage. Because it is planted for a week, it is a crescendo of colour but in the real world, you would need to spread it out a bit for a more reliable succession of flowers. Thomas Hoblyn was inspired by the formality of classic Italian gardens Villa Lante and Villa D’Este. The strongest design element is his use of the long water cascade, common to both, but here severely pared back from the original inspiration plus broad expanses of travertine paving. 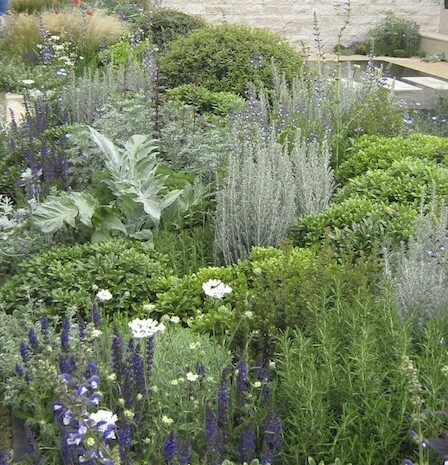 While the latter could be harsh, he used a form of abstract planting loosely based on the medieval knot garden with ribbons of Pittosporum tobira weaving through much less formal combinations of silver, purple and green foliage with tulbaghia, cardoon, geranium and artemisia. 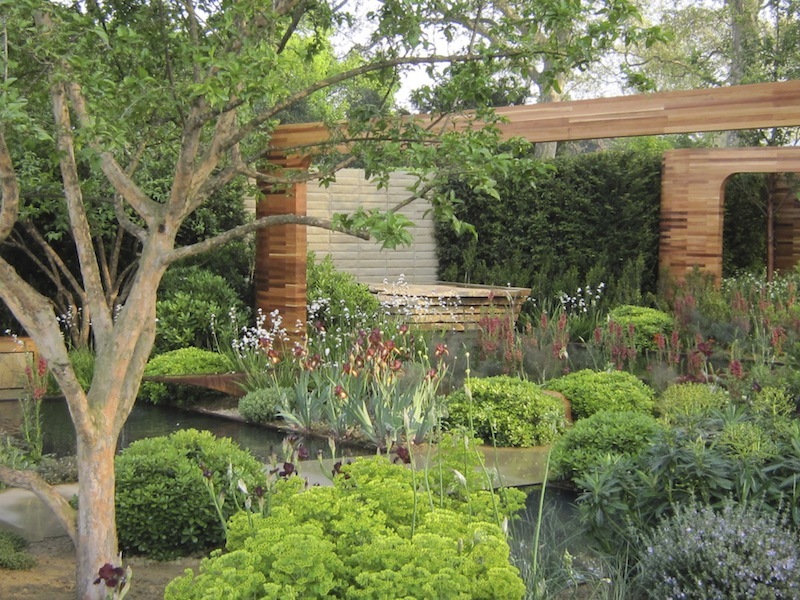 For me the design was secondary to the planting. 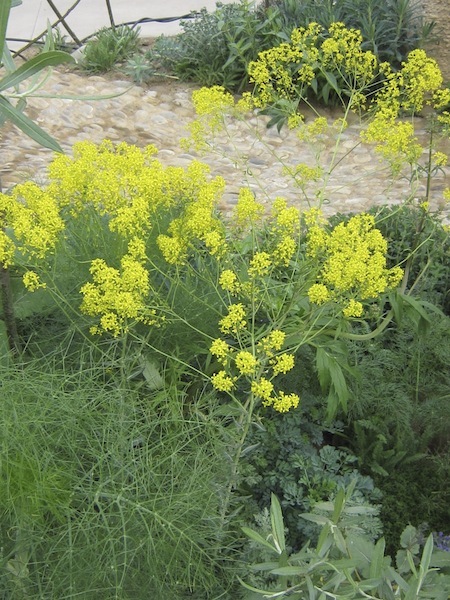 ‘Fresh’ was a new category designed to encourage a new way to look at gardens. Here are two that stood out. 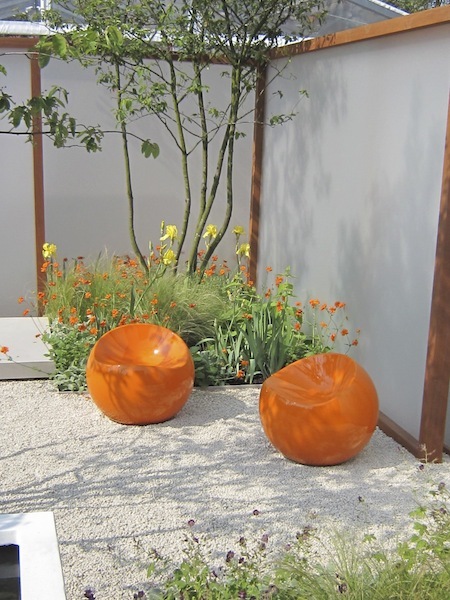 Chris Gutteridge’s contemporary garden was light filled space edged by frosted acrylic Japanese-inspired walls, bright white gravel and a fabulous orange and yellow planting scheme. Geum, yellow iris and purple accents were carefully blended proving you don’t need a grand scheme to achieve something eye-catching. 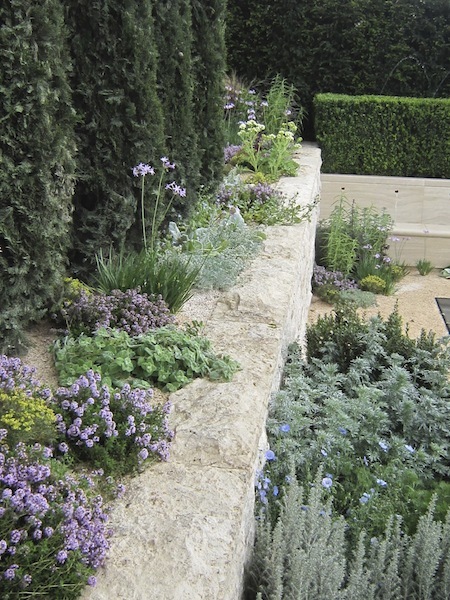 James Basson’s garden representing a dry river bed, featured rough stone and concrete pillars interplanted with Euphorbia spinosa, Thymus ciliatus and Thymus vulgare, Cistus albidus, valerian and Doryenium pentaphyllum. They presented a micro-tapestry of yellow, silver and grey. I’ve decided the way to do Chelsea is to look quickly, take it all in a gulp and then come up for air at the gardens that gave you oxygen while (metaphorically) submerged. Invariably they are the ones that most impress. With the others, you can observe in a more casual way. Sure, you might miss a gem but it is about managing your time. There is so much to see.